We have the occasional litter of puppies and because we love having puppies around, our puppies grow up here in our home and in the garden close to the house. We strongly believe that puppies shouldn't grow up in isolation and hence, our puppies are raised by our older dogs, 'Paws' the cat and us of course. They have the benefit of their mums until the day the leave home and in true Border fashion, our girls wouldn't want it any other way. 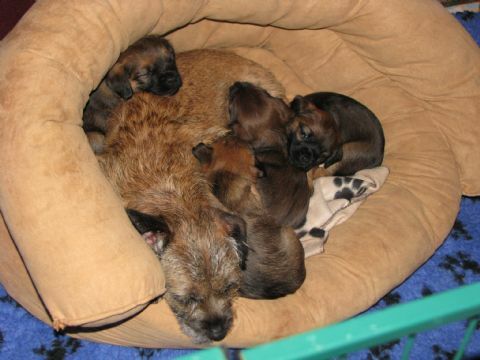 Mum has full access to the puppies as long as and whenever she wants. Watching them grow and play is the most wonderful, rewarding experience and we wouldn't miss it for the world. We play with them a lot and they sit with us every evening enjoying family life - after all, that's what they will be doing once you take him or her home. We will also ask you to think of a name for your puppy, so we can start calling them by their names, so to get them accustomed to it and hence make the transition into their new family easier. Our puppies will taste a variety of foods, ranging from meat, fish and poultry to vegetables, fruit, cereal and dry kibble. Since all puppies are individuals, we tailor their diet to their needs. And they have also access to mum's milk as long as mum is happy to supply. Microchip and first vaccination will follow as close to eight weeks as possible, as that ensures for the vaccine to be fully effective and they are old and strong enough to endure the insertion of a microchip. Puppies will be ready move into their new homes between eight and twelve weeks. We do not ask for a deposit, but will ensure that the puppy will be suitable for your circumstances. All our puppies are registered with the New Zealand Kennel Club and will be sold with their pedigree papers. All owners will be given plenty of literature to help them prepare themselves and their properties for the arrival of the new puppy and also to help with training and maintenance of the new family member. We hope you enjoy your puppy!